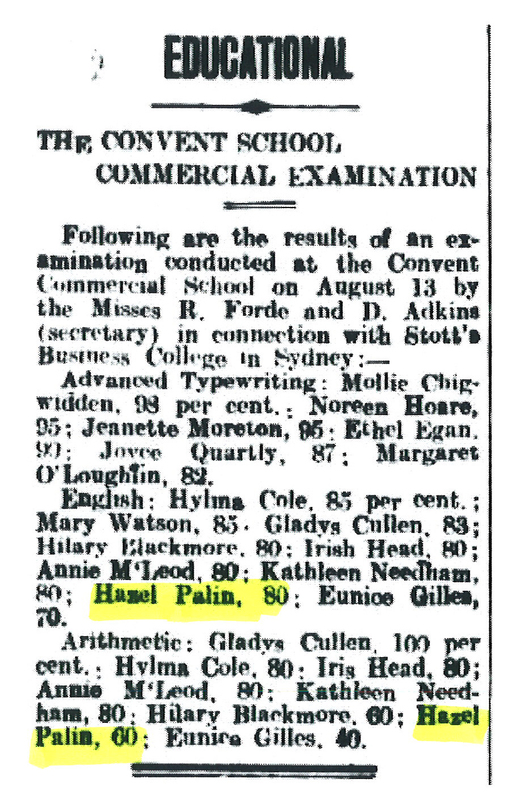 The first part of Edna Hazel Palin's (Hazel as she liked to be called) story finished with her marriage to Roy Clarence Herbert on 24 July 1929 (NSW BDM). Once married, Hazel took on the role of wife and mother, giving up her position as a clerk. As I mentioned earlier, conditions in Broken Hill post WWI were very tough with many strikes and unions demanding better working conditions for the miners. The longest and harshest strike was in 1919-1920 and lasted for 18 months. However, this prolonged strike brought about change and the unions succeeded in obtaining better conditions and shorter working hours for their members. The unions joined forces under one organisation, the Barrier Industrial Council (BIC) *. This council became a powerful body which had a great impact on the lives of the people of Broken Hill. 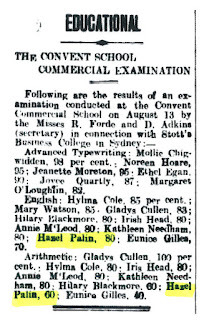 The formation of the BIC also had a historical influence on the life of married women in Broken Hill, including Hazel. In order to diminish unemployment the BIC introduced a resolution banning married women from working. Hazel and Roy's first son Charles John (Jack) was born in 1930. 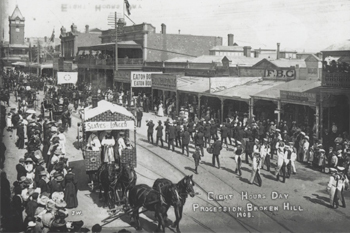 Roy was employed with the Zinc Corporation, one of the main mining companies in Broken Hill. 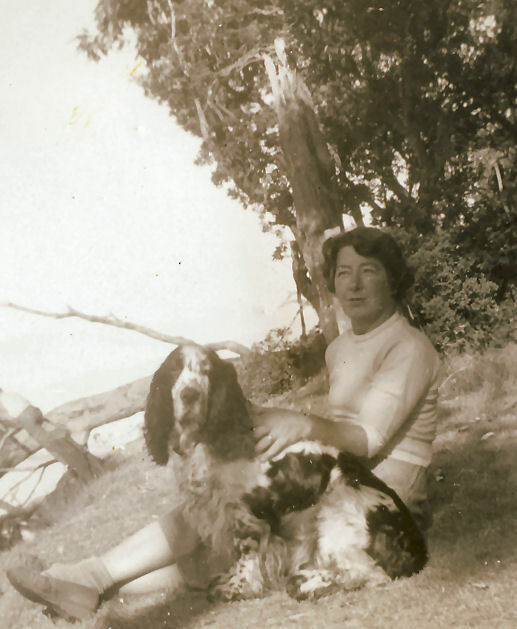 In the following years Hazel was fully occupied with the raising the family of two boys and three girls, Jack, Maureen, Joan, Brian and Faye. As her daughter Maureen recalls, she was an accomplished seamstress, making all the children's clothes, and often sewing for her friends. 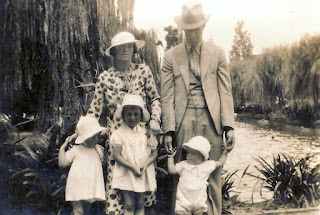 The young Herbert family on a picnic with their grandparents. Family entertainment included family picnics on the weekend at favorite picnic spots on the outskirts of Broken Hill. They would all pile into cars or many would go on motorbikes. 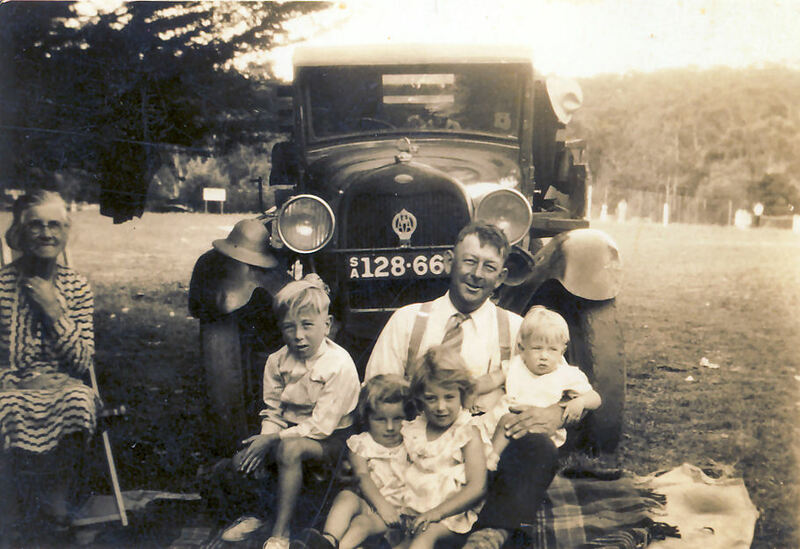 Maureen remembers her parents (Hazel and Roy) going to picnics with her younger sister Faye on Roy's motor bike and the rest of the family traveling in the car with her grandparents. The local swimming pool was also a vital part of the social life of the Herbert family, providing hours of entertainment, fun and relief from the searing summer heat. Maureen recalls with amusement, Mum (Hazel) could not swim at all "it was a joke for all the family, how she could not get the arms and legs to work in unison and we all kidded her that she would sink to the bottom. Down she would go.". In 1937, the family was to mourn the loss of their son and brother Brian, when he passed away at the age of eighteen months from pneumonia (NSW BDM 12217/1937). The other four children attended the local primary school and then once they were teenagers were students at Broken Hill High School. Life for the Herbert children was happy and content, with a house that was always full of friends and family. During the Christmas holidays, the family would travel to Adelaide to visit Hazel's sister Thelma and brother Alf and their families. 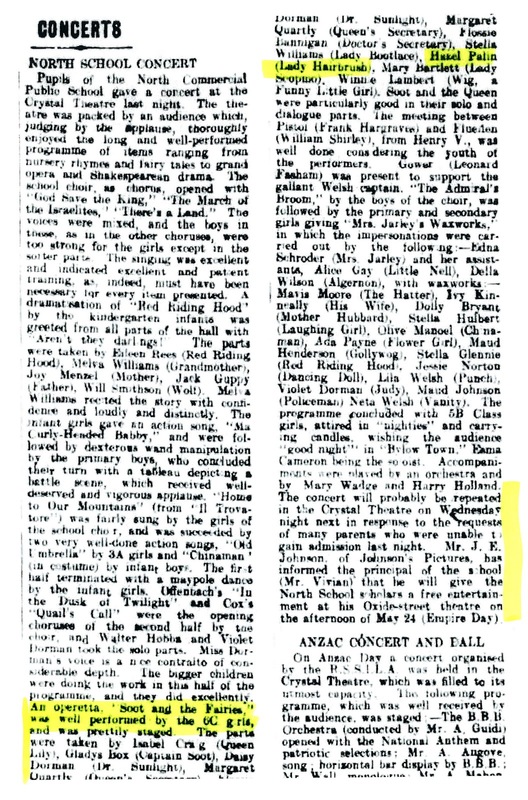 Hazel really enjoyed these times in the milder climate of Adelaide, catching up with family and sharing her love of music with her older brother Alf who played violin in the Adelaide Symphony Orchestra. Hazel's health was beginning to become a serious problem, and there many visits to specialists, where she was diagnosed as suffering from serious kidney disease. This is the final bog on the life of Christina Sterland Carriage (Shepherd nee Lee). The period from the 1950’s through to when she passed away in 1984 is the time when her children left home, married and had children of their own. What is special for this part of her story is that I am able include my own perspective and personal experience. I don’t think I can pinpoint my first memory of Nanna, though it must have been from a Christmas holiday early in my childhood. 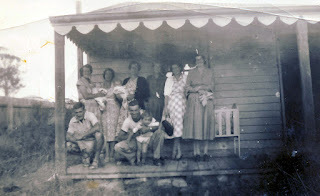 Every year our family would pack up our car and make the trek to Milton for three weeks holiday, staying with Nanna and Pop or in a rented house nearby. I remember her as being a tall lean lady, kind, but someone who would take no nonsense. As a small child I delighted in being in her company and would volunteer to go to Church with her in the evenings for that special one on one time (and of course to be shown off to all her church buddies as “Malcolm’s” eldest girl). As a teenager, I loved to curl up on on the old sofa in her cosy kitchen, with one of her crochet rugs over my legs and read one of the many books from her book shelf. Well, before I stray too far a must get back to the story. 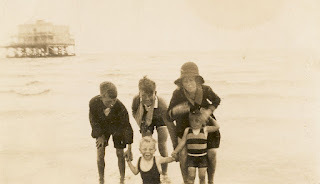 The last blog finished with Christina’s eldest son, Malcolm, joining the air force and being sent to Darwin for active service.. Fortunately, the war was very close to ending and he was soon back into civilian life. 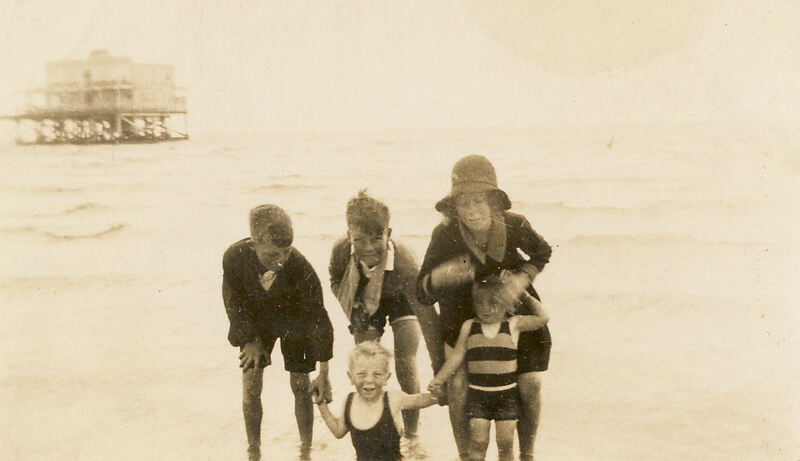 Over the next few years her three eldest children (Leo was still quite young) left home, married and had children. With the house empty, Nanna took in borders to help cover expenses and these borders became part of her extended family. Lionel (Pop) continued to work at the sawmills and had a small home business where he sharpened saws and axes. 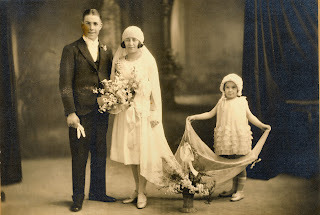 Their life was uncomplicated, with Nanna involved in the church and Pop was a member of the local Masonic Lodge. With a little more time on their hands they took up golf and became members of the local Mollymook Golf Club. 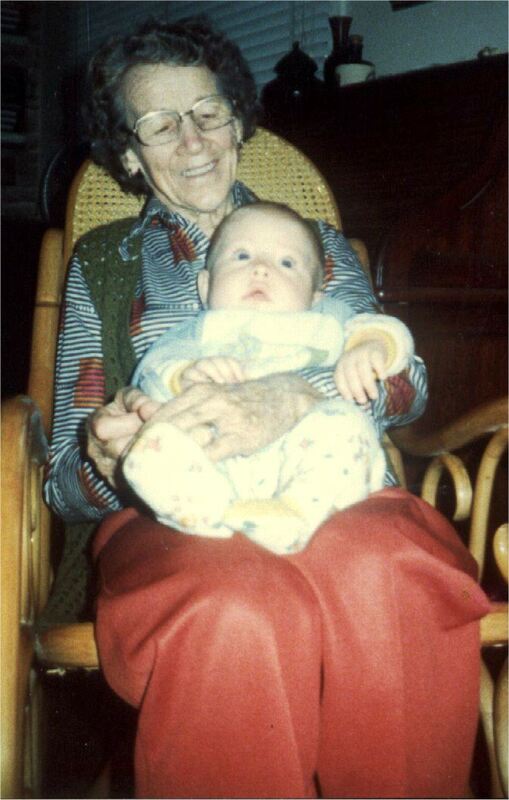 As I mentioned early, my strongest memories of Nanna were at Christmas time. All the family, would come to stay in Nanna’s house (until there was too many of us). Children would be bunked on divans, or in beds together, (topping and tailing). We spent hours playing in the garden, pinching Pop’s strawberries and feasting on the plums from their big plum tree. It became a family tradition for all the cousins to put on a Christmas Holiday Concert, where we would stage a number of short skits, dances and songs on Nanna’s front verandah. All the neighbours would be invited, and charged a silver coin for the honour of sitting on one of the rickety chairs set up on the front lawn. 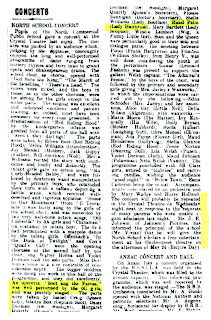 Then, the next day, to our delight Nanna would take us up to buy ice cream with the takings from the concert. Christmas Day in Nanna's house was something to behold. During previous week we would have all helped her make the Christmas pudding. She would buy a brand new plastic bucket to mix it in and all the grandchildren would take turns in stirring for good luck. Then on Christmas day, the kitchen would be a buzz with all the adults sharing in the preparation of the meal (and punch) under Nanna's direction. When it came to sitting everyone down for the hot meal a hierarchy of age was enforced. Adults at the dining table, and then the grandchildren, depending on their age would sit at the side table, card table, ironing board (on low setting) or high chair. What a sight to see!!!! Then when it finally came time to have the pudding Nanna would serve it with steaming hot custard and she would slip silver sixpences into each of the childrens bowls. Then when cents came into circulation, we would have to hand the sixpences back after the meal so they could be saved for next Christmas. 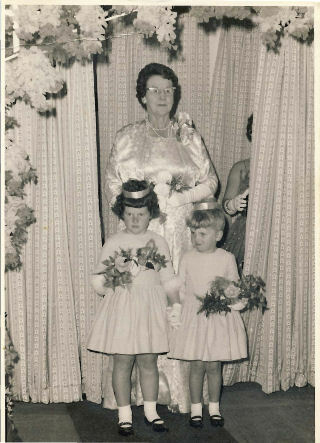 The late 1970- 1980’s saw another changing of the guard with her grandchildren turning 21, getting married and having children of their own. Nanna delighted in these family occasions and watched over the brood with a critical eye. I can remember if there was a sad family event such as a funeral she would have a small glass of brandy for medical purposes and if it was a time for celebrations she was quite partial to a glass or two of that “nice bubbly wine”. Teenie (Christina) and Lionel retired and continued life in the quiet town of Milton. Their son Leo and his family settled in the district and were of great support to them in their later years. Then in 1982 Lionel became very ill and passed away on the 10 February 1982. Teenie continued to live on her own in their family home. Then on a sunny morning, two years later on the 15 April, 1984 while sweeping her front path she passed away at the age of 82. As I reflect, on her life and all that she had experienced am glad that I have been able to share a little of her story.